Valley Center Stampede Rodeo, Inc. is a nonprofit corporation organized and operated exclusively for charitable purposes, specifically to preserve our town’s western heritage through an annual, family-friendly rodeo that educates and entertains the public, showcases the sport of rodeo, funds local student scholarships, and supports other community enrichment organizations. 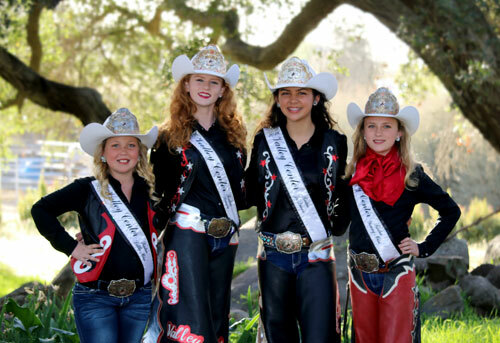 Additionally, the Valley Center Stampede Rodeo Queen program works year-round toward said mission, while also providing a unique opportunity for young female equestrians to become future community leaders. The Valley Center Stampede Rodeo & Memorial Festival is organized solely by volunteers and remains one of only a few non-profit rodeos in the nation. The Board of Directors is comprised of seven talented volunteers with the diverse backgrounds needed to put on an event of this magnitude. Additionally, talented members of the community serve as committee chairs and work with the board of directors to oversee all aspects of the rodeo and festival. With operational costs reaching over $125,000, largely due to the lack of permanent facilities, the Valley Center Stampede Rodeo volunteers proudly take on the monumental task of raising the rodeo grounds out of a dusty hay field each year. Despite the challenges, the committee takes great pride in the development of the high-quality rodeo grounds they produce each year. Since 2002, the Valley Center Stampede Rodeo Committee faced uncertainty each year of where the rodeo would be located. That concern was alleviated in 2018 through a five-year contracted granted by the Valley Center Parks & Recreation District (VCPRD) for the use of their newest park, Star Valley Park, home of the Valley Center Vaqueros (a local riding club). This semi-permanent home for the rodeo represents the community spirit of our quaint little town and generosity of our local people and organizations. The goal of both organizations is to develop a permanent equestrian facility for equestrians to enjoy year-round. The 2019 Valley Center Stampede Rodeo & Memorial Festival will mark the 18th year of bringing quality rodeo entertainment to our town and the neighboring communities of North San Diego County. This year will mark our second year as a Professional Rodeo Cowboy Association (PRCA) sanctioned professional rodeo. The Valley Center Stampede Rodeo is part of a community-wide effort to celebrate our town’s patriotism and western heritage over Memorial Day Weekend. The rodeo is made possible by the year-long efforts of the volunteer Valley Center Stampede Rodeo Board of Directors, the dedication of local volunteers and the generous donations from local businesses. The board of directors, committee members and organizers are all volunteers - there are no paid positions associated with the Valley Center Stampede Rodeo & Memorial Festival. We are always looking for additional volunteers and financial support. If you are interested in volunteering or becoming an event sponsor, please contact us today.